Your art is up, what’s next? It does take time for search engines to find you on our site, maybe 6-8 weeks, it doesn’t happen overnight. All our good work on the search end should bring in results but with your help, you can boost your results too! 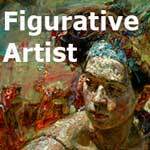 Save this image and put it on your site with a link to FigurativeArtist.org. Thanks for sharing! Have you shared your facebook PAGE with your update your information or asked our facebook PAGE to like your facebook PAGE? Professional Pages can LIKE other professional Pages and personal facebook connections are made with friend requests, slightly different. Have you followed our twitter? Give us time, but we’ll follow you back. We’ve created a lovely Pinterest page and plan to keep at it so that’s a great way to share the visual excitement too. We’re new to Google Plus but think it’s another exciting way to increase connections so check that out too and let’s connect. LinkedIN could be a great way to add meaningful connections. It’s all a bit of a gamble but these new social media tools can be very effective at making good connections and increasing exposure. The trick is to keep on target and not get lost. Good luck in the playground! 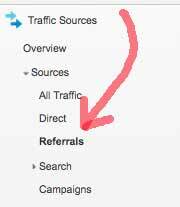 How to see traffic coming to you from our site? The way that you see which traffic comes to you from our site is to look at your own analytics on your site and see where referring traffic is coming from. I would say this does take some time but if you help with the publicity and check in very couple of months, you should see traffic coming from our site. Your own site may already have another kind of analytics so check that out first but Google Analytics deliver very powerful statistics, especially over time. You see where visitors come from by country and city, the keywords they found you with, referring sites, how long they stay, which pages they visit, which page they landed on, which page they departed from, which operating system they use… Lots and lots of very interesting information! 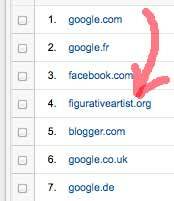 If you don’t have Google Analytics on your site, it’s really a valuable thing to do and really not too hard. How you put the tracking code on your site depends on what kind of site you have. 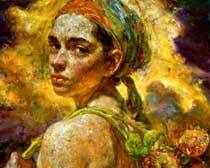 Give it a couple of months then give yourself a Google search with your name & figurative artist. Our listing should show up. 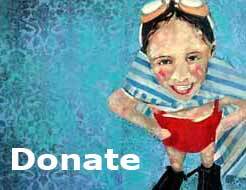 Your name alone may not deliver results because there may be many with that name and it really needs art, artist or figurative artist to deliver reasonable results. I’d be interested to hear your results in a few months. Good luck!